The pig dates back 40 million years to fossils, which indicates that wild pig-like animals roamed forests and swamps in Europe and Asia. By 4900 B.C., pigs were domesticated in China, and by 1500 B.C., they were being raised in Europe. On the insistence of Queen Isabella, Christopher Columbus took eight pigs on his voyage to Cuba in 1493. However, it is Hernando de Soto who could be dubbed “the father of the American pork industry.” The explorer landed with America’s first 13 pigs at Tampa Bay, Fla., in 1539. Native Americans reportedly became very fond of the taste of pork, resulting in some of the worst attacks on the de Soto expedition. By the time of de Soto’s death three years later, his pig herd had grown to 700 head, not including the ones his troops had consumed, those that ran away and became wild pigs (the ancestors of today’s feral pigs or razorbacks) and those given to the Native Americans to help keep peace. Pig production spread throughout the new colonies. Hernando Cortez introduced hogs to New Mexico in 1600, and Sir Walter Raleigh brought sows to Jamestown Colony, now in Virginia, in 1607. Semi-wild pigs conducted such rampages in the grain fields of New York that colonists who owned a pig 14 or more inches high had to put a ring in the pig’s nose. On Manhattan Island, a long solid wall was constructed on the northern edge of the colony to control roaming herds of pigs, as well as to protect the colonists from native Americans. This area is now known as Wall Street. 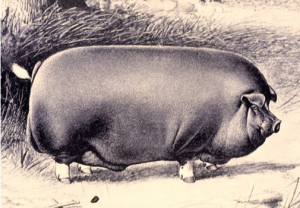 The pig population in the Pennsylvania colony num­bered in the thousands by 1660. As the 17th century closed, the typical farmer owned four or five pigs, supply­ing salt pork and bacon for his table, with surpluses sold as barreled pork. Following a practice that had become common in Pennsylvania, pigs were fed a diet of native American corn. After the Revolutionary War, pioneers began head­ing west, taking their indispensable pigs with them. A wooden crate filled with young pigs often was hung from the axles of prairie schooners. As western herds grew, so did the need for pork pro­cessing facilities. Packing plants began to spring up in major cities. Pigs were first commercially harvested in Cincinnati, which became known as Porkopolis. More pork was packed there than any other place in the mid- 1800s. Moving pigs to market in the 1850s was no small undertaking. “Drovers” herded their pigs along trails, which later developed into railroad routes. 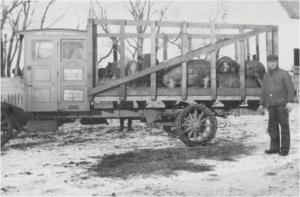 Between 40,000 and 70,000 pigs were driven from Ohio to eastern markets in any one year. Drivers, the drovers’ hired hands, each managed up to 100 hogs, and the herds moved five to eight miles a day, covering distances up to 700 miles. The refrigerated railroad car transformed the meat industry when it was introduced shortly after the Civil War. It enabled packing plants to be centralized near points of production instead of near points of con­sumption. Large “terminal markets” with railroad access developed in major cities, such as Chicago, Kansas City, St. Joseph, Mo. ; and Sioux City, Iowa. Large packing plants were located adjacent to these stockyards. Live pigs were shipped via railroad to the markets, and pork was shipped, again mainly by rail, to consumers nationwide. As a result of these transportation developments, the pork industry relocated to the upper Midwest, where ample amounts of feedgrains were produced, and the “Corn Belt” also became known as the “Hog Belt.” In fact, Iowa, Illinois, Minnesota, Nebraska, Indiana and Missouri held the top six spots in state rankings for pork production for many years. Iowa is still No. 1. The 1980s and 1990s brought major technological developments in the pork industry, some of which allowed production to grow dramatically in states not known for pig production. The most notable growth occurred in North Carolina, which is now the second largest pork- producing state. Despite inherently more expensive feed, North Carolina producers became cost competitive by using pigs with the genetic capability for higher reproductive efficiency and enhanced lean muscle growth, resulting in better feed efficiency. They also captured economies of size and developed pig-raising methods that controlled disease, and improved productive efficiency. Many producers in other areas have now adopted these same methods. Today the United States is one of the world’s lead­ing pork-producing countries. Also, the U.S. became the largest pork exporter in 2005 and remains so today. U.S. production accounted for 10 percent of total world supply in 2012. You can find more information about today’s U.S. pork industry at the Pork Checkoff’s Web site at pork.org or call the Producer Service Center at (800) 456-7675.